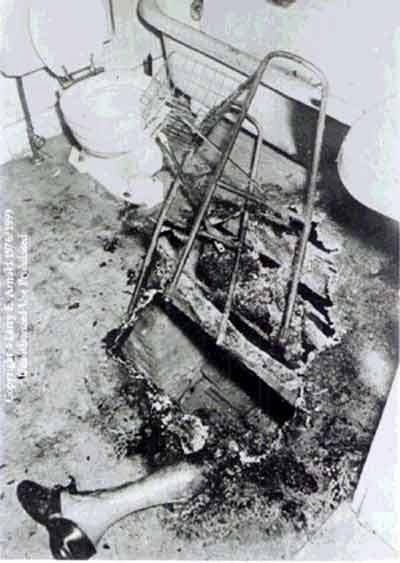 Spontaneous human combustion (SHC) is the alleged burning of a person's body without a readily apparent, identifiable external source of ignition. The combustion may result in simple burns and blisters to the skin, smoking, or a complete incineration of the body. The latter is the form most often 'recognized' as SHC. There is much speculation and controversy over SH...C. It is not a proven natural occurrence, but many theories have attempted to explain SHC's existence and how it may occur. The two most common explanations offered to account for apparent SHC are the non-spontaneous "wick effect" fire, and the rare discharge called static flash fires. Although mathematically it can be shown that the human body contains enough energy stored in the form of fat and other tissues to consume it completely, in normal circumstances bodies will not sustain a flame on their own. John Irving Bentley (1874–1966) was a physician who burned to death in the bathroom of his house in Coudersport, Pennsylvania. Bentley was last seen alive on December 4, 1966, when friends visiting him at his home said goodnight to him at about 9:00 P.M. On the following morning, December 5, Don Gosnell, a meter reader, let himself into Bentley’s house and went to the basement to check the meter—since Bentley could only move about with the help of a walker, Mr. Gosnell had permission to enter as necessary. Do you have a story, photo, suggestion, complains or comments for us? Send in your entry rahs08gmail.com and we will feature the story with your name.